Slowly, you are getting a tour of my house. Over the next little bit I'm going to show you my sons nursery. Today, as a sneak peak I'm going to show you a difficult are of his room. It was a design dilemma for quite some time. But I finally came up with a solution! This is the area that had me frustrated for some time. This area is so cute. But unfortunately, some idiot decided to put the heater in that spot. Not like anywhere else made more sense. Our next house will NOT have wall heaters. It really cuts down on your layout options. 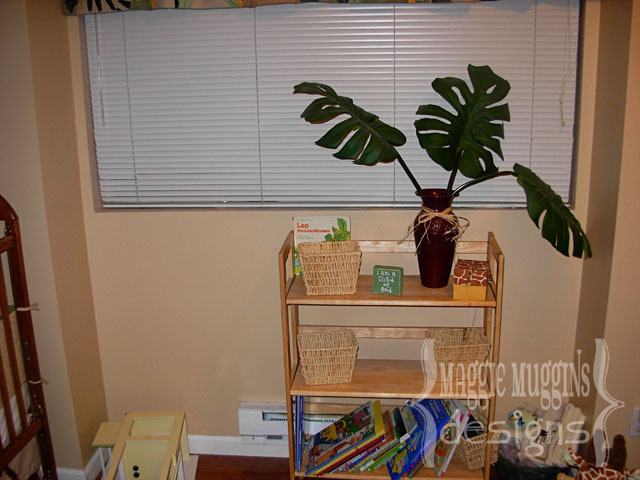 For example - wouldn't this be a great spot for a cute window seat, or a desk? But then the heater would, of course, be blocked. Of course, even putting a shelf in the area obstructed the heater. Really, I'm not opposed to blocking the heater off a little, but in a baby's room or kids room I'd rather be safe than sorry. Besides, I don't want to pay higher heating bills just because I put something in the way. Then I came home and asked my husband to help. He measured, marked, taped and cut. We used painter's tape on the outside of the boards along the line we were going to cut to prevent splinters from the saw. 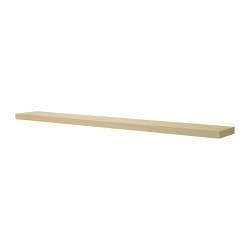 An idea I found on IKEA Hacker. I love the look of floating shelves and how it looks like built-in shelves. Of course, it's not perfection, but it's a lot more shelving than we had, and I love it. That's all that really matters to me! I happen to have a dilemma here too though. I feel like it still needs more of a window treatment than just the valance. I want it simple and not overbearing. I also need it to be black-out. Any suggestions?! I'm linking this to Amanda's Decorating Dilemmas Party at Serenity Now. This is such a cool party. Smart Solution! 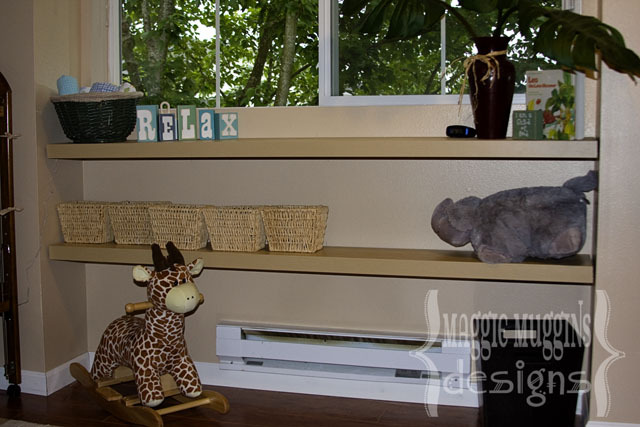 Your shelves give you a great display and storage area in this space. I love your curtain, the design is so cute. What about hanging a roman shade underneath, maybe one that looks like bamboo? A fabric roman shade would look great, too. Love your shelves! For your window have you thought about making Roman Shades? You could line them to make them so that they are black out. The floating shelves are perfect! What a gorgeous little nook! I kind of like the valance by itself and then you could by the blackout roller shade that when rolled up would hide behind the valance. Good luck! I love the shelves! The outdoor foliage gives you a lot of privacy, so I would make curtains to fit the window. Hang them behind the valance so you can easily open and close them.Then I think your wall would be complete! Stopping by from Decorating Dilemma. I love the way the shelves turned out!! They make such a difference in that little niche. First off, with the window treatments, I would raise that valance. It looks to me like it is covering a portion of the window. 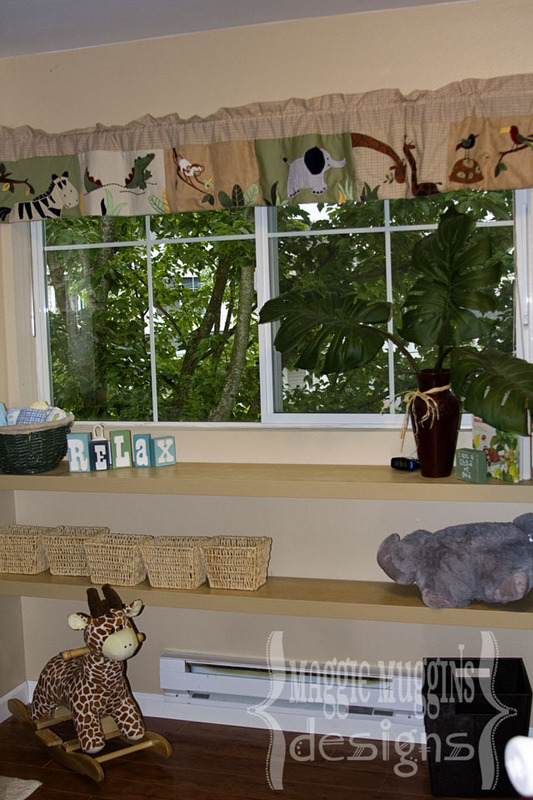 With the bottom of the valance just below the top of the window you will get more light and more height to the window. Then maybe a simple ivory panel on each side, tied back with some jute string? I also like the bamboo and roman shade ideas. Love, LOVE the shelves! Very cute and give you lots of space for storage! I think roman shades would look nice in the window... you can get creative with them and they'd block out that pesky sunlight! I love the solution you used! It looks so good, and who doesn't need more storage for kids stuff! I'm not sure what to do about window treatments. Wooden blinds are the only thing on any of the windows in my house! Great solution!!! :) The new shelves look fantastic...we used to have the wall heaters when we first moved in to our house and they are a major downer. But you made them work! Those shelves are a great idea! It looks like you still have the blinds - could you swap those out for something black-out? Maybe a roller shade? The valance you're using is adorable, and its difficult to tell scale from the photos, but have you thought about either replacing it with something larger, or maybe adding some solid color fabric to the bottom to make it more substantial? Or, maybe hanging it from ring clips on a curtain rod - that could make it a bit taller? Just some ideas - good luck! And, again, I love those shelves! Those shelves look great, and perfect size, wow! Great job! I was in Target the other day looking at curtains. They have a decent selection of inexpensive curtains with the blackout liners sewed in. They are plain, but relatively inexpensive. You could dress them up with trim--stitchwitchery iron-on tape comes in several widths, which offers easy no-sew solutions for that type of thing. Yes!!! When I first saw that little bookshelf, I thought it was way too small for that space. And I was just thinking of shelves. Those look amazing. What a great solution!! If not roman shades, than I'd say sew up some simple panels with a lining. Great solution. It looks fantastic!